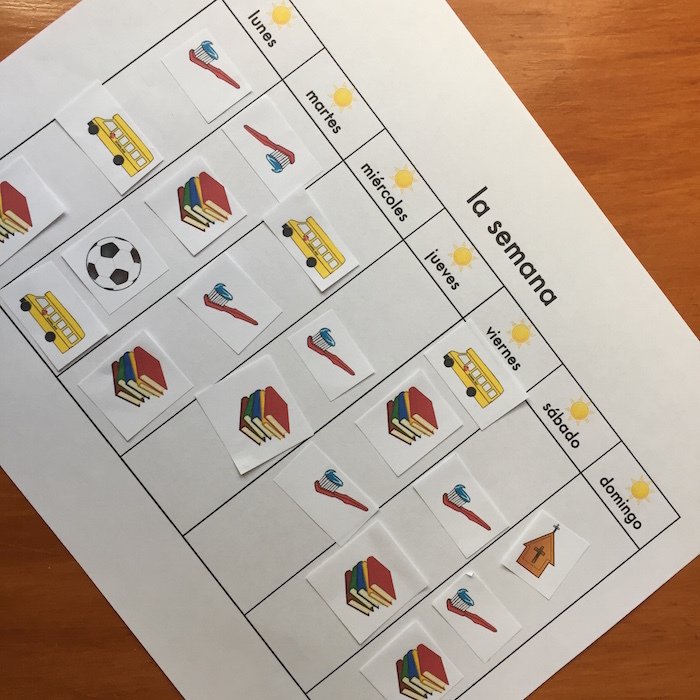 Learning the days of the week in Spanish helps children talk about their activities and schedules. The easiest way for teachers to present the days is with daily calendar time, but many of us have class only once or twice a week. Here are a few Spanish days of the week activities that you can adapt to your class schedule or use at home. 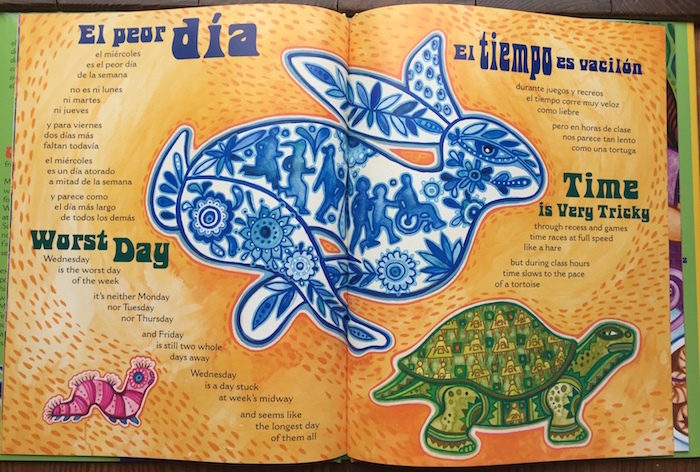 When you’re introducing the days of the week in Spanish, it helps kids to hear them repeatedly in context. Try this Kids Learn Spanish Habla video where Pamela takes about her week using high-frequency language. You can also check out our YouTube playlist of videos and songs to learn the days of the week in Spanish. 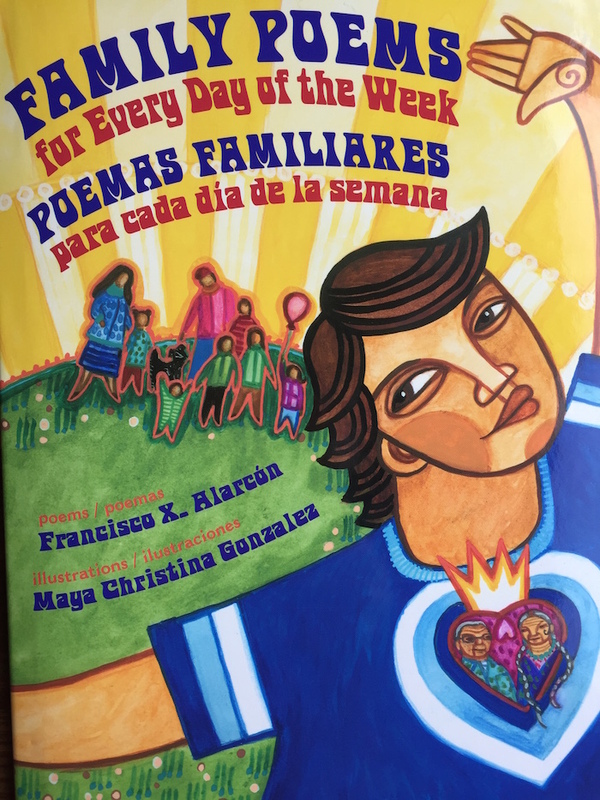 Publisher Lee & Low Books recently sent me the wonderful new bilingual picture book Family Poems for Every Day of the Week/ Poemas familiares para cada día de la semana. This beautiful collection of poems in English and Spanish is by Francisco X. Alarcón and illustrated by Maya Christina Gonzalez. You should definitely add this book to your Spanish days of the week activities! 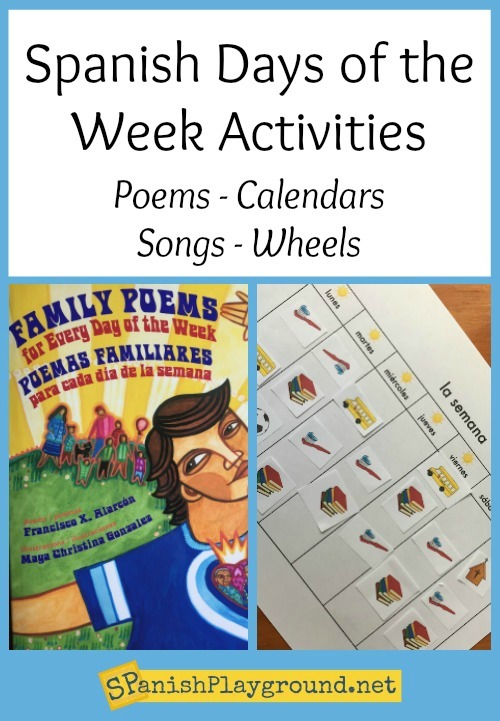 The poems in Family Poems for Every Day of the Week/ Poemas familiares para cada día de la semana center on home, family and school, so the vocabulary is appropriate for language learners. There are several poems for each day of the week, including a short poem about the origin of the name of the day and how it relates to the gods and planets. Most of the poems are in the first person, and young readers will identify with the speaker as he explores weekly routines and how he feels on different days. These poems lend themselves to many Spanish day of the week activities. In addition to reading and reciting the poems, children love exploring the amazing illustrations and creating their own drawings to illustrate a day of the week. Family Poems for Every Day of the Week/ Poemas familiares para cada día de la semana is available from Lee and Low and on Amazon. This fall, I made this cut and paste calendar to add to my Spanish days of the week activities. My students needed an activity that would give them lots of repetition of the days and high-frequency verbs in a meaningful, personal context. I chose small pictures to represent activities I knew my students did regularly, either every day or at least once a week. For example, there are pictures for brushing teeth, reading a story, soccer practice, riding the school bus, going to church etc. I provided a one-week calendar with the days, but no dates. Then, students cut and pasted pictures to show what they did each day. If I didn’t have a picture for an activity, students drew a simple symbol. I was really happy with how this activity turned out. Also, the kids loved seeing their week in pictures! In addition to saying the days of the week over and over as they made their calendars, we used the calendars to talk about the week when they were done. For example, they could answer questions like ¿Lees cuentos los lunes? ¿Qué haces los martes? ¿Qué día juegas al fútbol? etc. Depending on the level of your students, you could add the first person of the verb with the picture. You can download a PDF of my week calendar and the clip art I used for the activities. Of course, you will have add clip art for other activities and be sure to add additional houses of worship for all of your students. Download the La Semana Calendar and the Activity Pictures. I use several songs for learning the days of the week in Spanish. We sing these before we begin other Spanish days of the week activities so that students are familiar with the vocabulary and pronunciation. 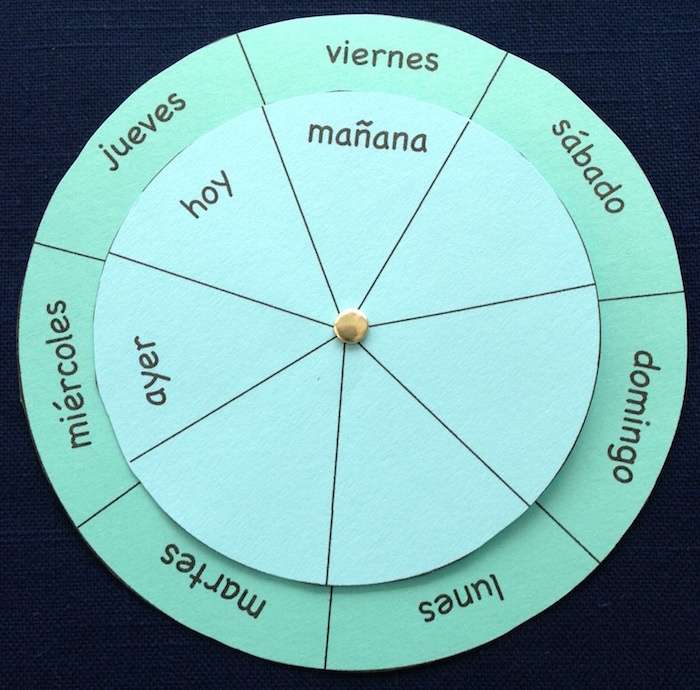 I also use a printable wheel to practice the days of the week in Spanish. I made this years ago, but it works well, so why reinvent the wheel? That was a pun for those of you who are is still reading. There are several versions of the printable wheel. One has extra vocabulary, and another has verbs. You can find them all in this post: Spanish Days of the Week Printable Wheels. ¿Cuántos días tiene el mes de…? ¿Qué día de la semana es el primer día del mes de …? El otoño/invierno/primavera/verano comienza el 21 de …. ¿Qué día de la semana va a ser? ¿Cuántos días lunes tiene este mes? ¿Cuántos días domingo (u otro día) tiene este mes? ¿El mes de …. tiene más días lunes o más días jueves? ¿Qué día de la semana va a ser el último día del mes de …? ¿Cuántas semanas completas tiene este mes? Read more about Spanish days of the week and calendar questions and download a Spanish calendar for December. Do you have favorite Spanish days of the week activities? If you have games, books, or songs you like, please share them with us in the comments below. Thank you!